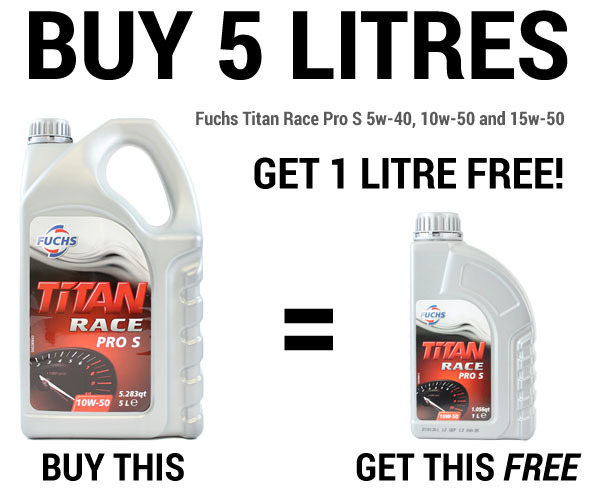 trackscotland.co.uk :: View topic - Fuchs Titan Race - free litres! Thu Mar 23, 2017 8:59 am Post subject: Fuchs Titan Race - free litres! Opie Oils are pleased to announce that we're currently running our very popular Fuchs offer on our top 3 Titan Race Oils - FREE 1 LITRE with every 5 litre of Fuchs Titan Race Pro S 5w-40, 10w-50 and 15w-50! You can order any number of 5 litre bottles to get the same number of 1 litre bottles absolutely free. For example, if you buy 4 x 5 litres, you will also receive 4 x 1 litres free of charge. To receive your free litre, make sure you select the promotional 5 litres (Plus a FREE 1 litre) option that will be displayed seperately from the standard 5 litre option. This is a limited time offer, running only until stocks last, so get those orders in quick! If you're a fan of free 1 litres, special offers and discounts, then you may want to have a look at our CURRENT OFFERS page. We're sure you'll find a great deal.